Hello Loves. 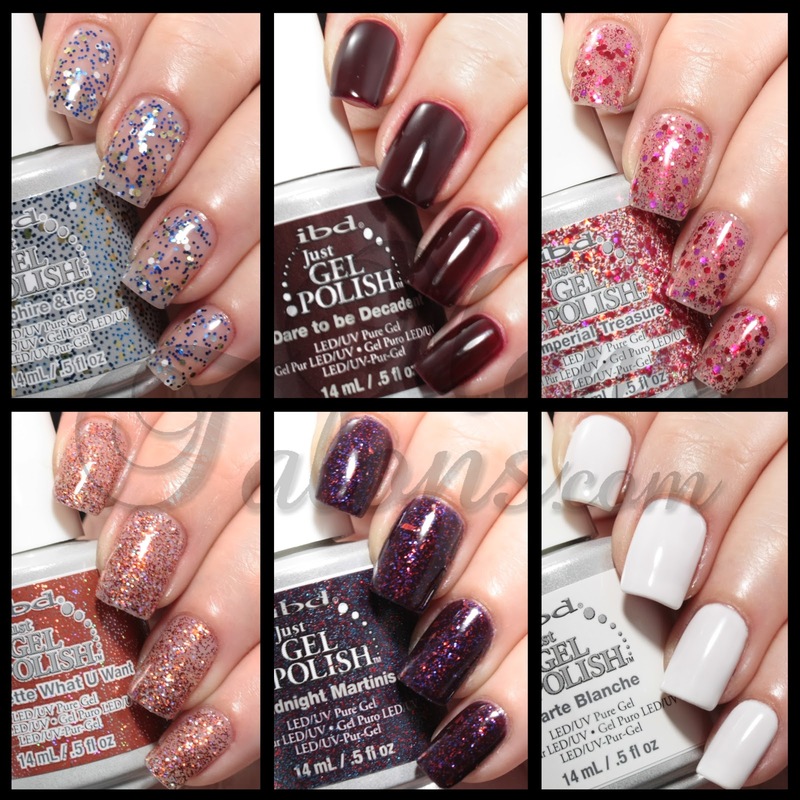 I have 6 of the 8 polishes from the IBD Just Gel Haute Frost Collection to show you today. I was hoping to have them all, but Yuri Berry and Siberian Minx are on back order. I'll show those as soon as I can get my hands on them. Yuri Berry is on it's way to me now and should be here next week. Siberian Minx is proving harder to find. I'm really on the fence about this collection so far. The glitters are fantastic, but the creams are a little disappointing. With a name like "Haute Frost", I was really expecting frosts instead of creams. Especially the white. I also find the formula for the creams to be a bit difficult. Carte Blanche is a little thick and needed extra time to level out to avoid streaks. Dare to be Decadent gave me major fits. I'll elaborate on that statement in a few moments. For now, let's get on with the swatches, shall we? First up is Carte Blanche. I really wanted this one to be a frosty white. Instead, it is more of a winter white - a pure cream with a very slight greyish undertone. Far from the bright whites that I love the most. Since this post is going to be picture heavy, I won't show another shot of this one. After all, not much exciting about white, right? The next on my list to show you is this gorgeous glitter called Imperial Treasure. Pink and red ultrafine glitter with larger red and purplish-pink hexes. As usual, this is three coats. This one would be quite stunning layered over a hot pink or even deep pink base. Sadly, I don't have an IBD in either of those colors that aren't shimmers, so I chose to layer two coats of this one over Carte Blanche. Ready for another glitter? This little beauty is Sapphire and Ice. Smaller blue glitters with with larger gold and white hex glitters. Again, this is three coats. As a side note, I leave my glitter polishes upside down for a bit before I swatch them since the glitter seems to sink to the bottom. To really appreciate this one, you have to see it over a dark color. For this layered mani, I started with a base of IBD Black Lava and layered two coats of Sapphire and Ice over it. I apologize for not taking a picture of Black Lava on it's own. This was part of a late night swatch-a-thon and I simply forgot. This next one may be my absolute favorite from the collection. Midnight Martinis is a dark purple base that is packed with red and blue ultrafine glitter and these funky shaped larger red glitters. It is completely opaque in two coats. I swatched three as usual for consistency, but the third was not needed at all. The second shot is blurred slightly to show the dimension of this polish. This next polish is Dare to be Decadent. It is a very pretty brown with burgundy tones. Sadly, this is the one gave me fits. The first attempt resulted in curing issues. It is extremely thick for IBD, and with the new stiff brushes, it was very difficult to apply without streaking. Even so, it wrinkled on the edges and refused to cure in spots. I ended up having to thin it with a few drops of gel polish thinner after warming didn't fix the issue. That fixed the wrinkling and curing issues, but it was still difficult to apply and you can see where it streaked in spots. Oh, and it stained my skin when I soaked off the first attempt. I don't know if I simply got a bad bottle or what happened here, but I am very disappointed. Such a pretty color to be so difficult. I usually wouldn't post a swatch that looks this bad, but after swatching it twice, I refused to try again and moved on to the next one. Finally, we'll end with another glitter. This burnt orange and holographic ultrafine beauty is Coquette What U Want. The shift in this glitter topper is quite impressive. As usual, this is three coats. To really appreciate this one, you have to see it over a dark base. It layers beautifully over Dare to be Decadent. This photo is slightly blurred to capture the brilliance of the holographic pieces. That's all for now. When I get the Siberian Minx and Yuri Berry, I'll swatch and show those as well. My closing thoughts: The creams so far leave much to be desired in my opinion, but the glitters...wow. They are all very fun and unique. I can't wait to get my hands on Yuri Berry and Siberian Minx to see how they stack up. Wow, can't wait to get Martinis and Treasure! I'm not one for blues normally, but Sapphire is gorgeous! I like the idea of Carte Blanche, sounds like a good winter white to use, often a crisp white is too white, and my other go-to has a softer pink undertone which is lovely, but a cooler white like this would be great for cooler manis. Too bad about Dare to be Decadent. I've not been keen on the new bottles since they widened the neck of the cap - harder to hold well for me. Both creams I've tried in the new bottles have been thicker - quite different from the super thin gels that ibd is known for, and more like Gelish, not an improvement. :/ Hopefully they don't stick with this trend. I appreciate the honesty. We shouldn't have to do backflips to make our gel polish behave. I actually like Coquette What you Want the most. I'm swimming in loose glitter over here so will likely pass on this collection. IBD used to be so consistent- not exciting as much but consistent. This makes me question their formula and brush choices of late. I hate writing reviews that are even the least bit negative, but I know that my readers look to me to show them the true products, regardless of the outcome. That's one of the reasons I always swatch colors and glitters without undies - if they are sheer, I think people want to know it so they don't order a product expecting one thing and get another. It's the down side of blogging, I guess. I still love my IBDs and will likely try a few more collections before giving up on the creams and sticking to the glitters, but I do hope this is isolated to a few colors. I did notice that two of the dark colors in the last collection were a bit tricky to apply, but not as bad as Dare to be Decadent. "Gel polish thinner" and "warming" to fix wrinkling? I've never heard of this… Do you have a specific post about this or can you link to information on this? If not I'd LOVE a how-to post! I hate when gel polish wrinkles and I was under the impression there's nothing you can do but start over.